We have quite a few foodies here. And it seems that people just generally like to eat. 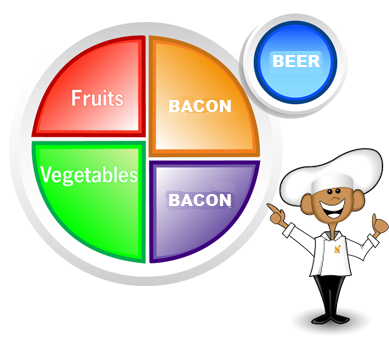 So I've been kicking around the idea of a food group. Every week or two, we all do an assignment. Either myself, or someone else here, will assign an idea. The idea could be a food type, a region of the world, a color. We then interpret that color, make something, and present it back to the group. If it takes off, maybe we do some contests, or eventually print out a UF cookbook. I dunno. Would you guys be interested in this? Fruits and veggies? Screw that, add more bacon! Fruits and veggies? Screw that, add more turkey bacon! turkey bacon, like da fooseball, is fo da devil!!!!!!!!!!!!!!!!!!!!!!!!!!!!!!!! I think we have our first theme. Or are you applying for QA? I actually can cook, believe it or not. Leave cats out of this, you slore.